Part of the excitement of being a repeat guest at Walt Disney World is that, even though we have already been this year - and at least once a year for the past... well, 13 years for me - there are always so many new things to see, do, and/or eat! This trip, in particular, has a LOT of firsts! I avoided making ADRs at my favorites so we could try some new favorites. We are staying in a new resort, trying a family suite for the first time, driving down #eek. Yes, I just used a hashtag in this post, but I felt it was necessary! Art of Animation - We toured the grounds and even dined in the Landscape of Flavors in February, but I'm excited to stay in a Cars Family Suite! Whispering Canyon Cafe - While my friend, Katie, reviewed it for the blog a while ago, I've never tried it - heck, I've never been to Wilderness Lodge! Boma - The third and final sit-down restaurant of the Animal Kindgom Lodge/Kidani Village taste explosions, we will finally try Boma on our arrival night! Jiko and Sanaa are both faves, and I'm hopeful this will be another winner! Driving Down- While we've driven up from South Florida, we're going to be driving down from D.C. - 1,000 miles away. Yes, we'll be stopping a little more than half way, but still - I bet we'll be extra exhausted. Spread some happy thoughts our way for a peaceful drive! Fast Pass+ - This is new to everyone and still in testing (and errors) phases, but thanks to our friends who have regular tickets, we're piggy backing on our travel buddies fast passes and will be seeing how the new system works with our Magic Bands. 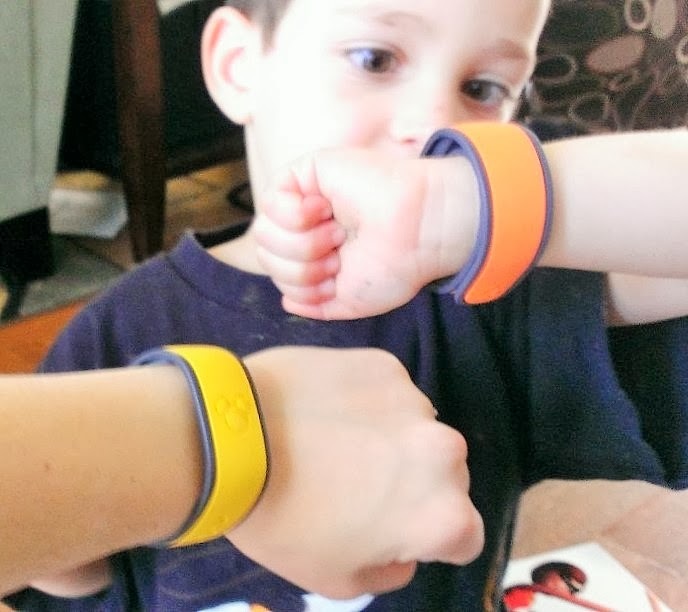 He thinks our Magic Bands will help us get to Grandma and Grandpa's faster... we'll see how the "surprise" goes! Do you try new places and experiences on trips? What is on you bucket list? I'm sure he will love the surprise. That's so neat. I've only been to Disney World twice and Disneyland once, so every time we go it's full of new experiences. The closest thing I can relate it to, is that my husband and I (and our kids now) have visited DC at least once a year for the past 11 years. I had been going down for years before that also. We got in a rut of see the same stuff over and over again. So about 5 years ago we started looking for new and different things to go see and do and it has made visiting fun all over again. We are heading there next week and FastPass+ and touring the Art of Animation are on my list!